ARENA is playing a vital role providing bridge funding for projects that will make large-scale solar photovoltaics (PV) more competitive by increasing confidence and building supply chains. In line with ARENA’s investment priorities and part of the Advancing Renewables Program (ARP), this competitive funding round aimed to support further cost reduction in large-scale solar PV. This competitive process has encouraged a significant drop in grant funding over the last three years. In 2014, the grant funding needed for large-scale solar projects was $1.60 per watt. In 2015, this dropped to 43 cents per watt at the expression of interest (EOI) stage of this funding round; and to an average of 28 cents per watt in June 2016, when full applications were submitted. By September 2016, the average requirement of the successful applicants at September 2016 is an incredible 19 cents per watt. Additionally, total project costs have been reduced by around 40%. When this funding round was announced in September 2015 it was expected that the $100 million in grant funding would enable around 200 MW of new projects. Through the round this has more than doubled, with the $92 million funding announced supporting around 480 MW in total. 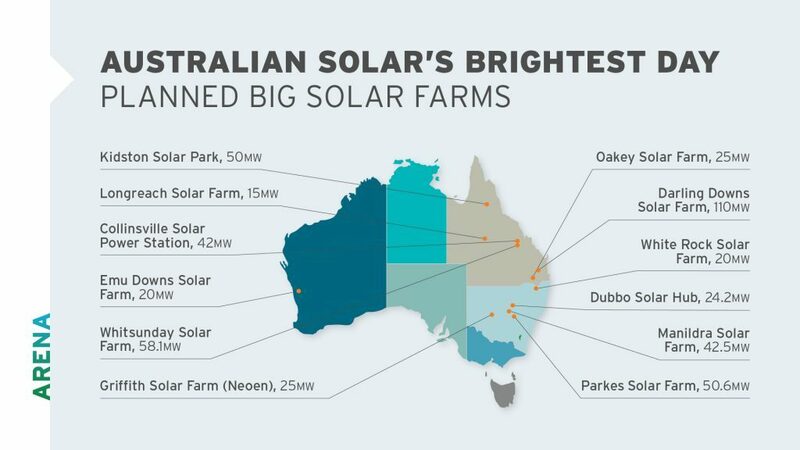 This growth in the local large-scale solar PV sector continues to provide a significant boost for Australia’s regional economy, the massive renewable infrastructure build estimated to create upwards of 2,300 direct jobs and thousands more indirect jobs. The amount of third party investment leveraged for each government dollar has risen dramatically, from 80 cents to about $10 for each dollar the public invests through ARENA. This will turn ARENA’s $92 million investment into a $1 billion investment in renewable infrastructure. ARENA has worked closely with industry, State Governments and the Clean Energy Finance Corporation, in developing this funding round. Once complete, the new solar farms will triple the amount of energy produced from big solar in Australia, powering 150,000 average Australian homes and meeting 10% of the capacity build needed to meet the 2020 RET (renewable energy target). projects must not involve behind the meter elements. ARENA has observed significant cost reduction in large-scale solar PV over the past few years and expects this to continue due to a combination of international and local improvements. The competitive round is expected to be critical in supporting this outcome by helping to close the current cost gap that exists between large-scale solar PV and other commercially competitive forms of power generation, including wind energy.